Home » Drought • Drought and Watering Issues • Lawn Care Questions Answered • Scarification • Summer Lawn Care » Question: Should I scarify my lawn after the heatwave? I received this question from a reader in July 2018. This was just as the famous 2018 heat wave was breaking. Lawns were very dry and there was virtually no rain for months. Lawns looked terrible and almost all lawn work was put on, hold. 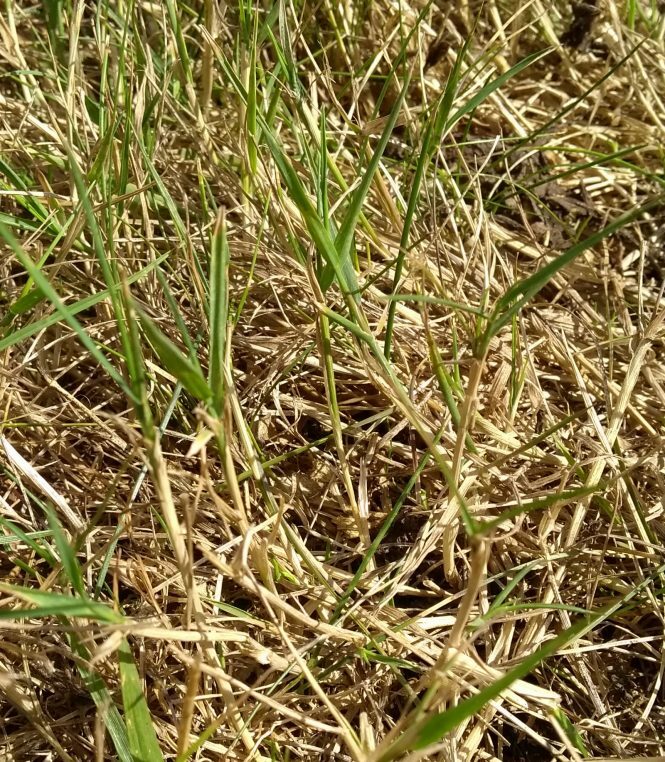 This reader asks the question “should scarify my lawn after the heatwave”. My lawn is looking very sad due to the recent heatwave, I have been watering to maintain the green colour but quickly lost the battle as it soon turned dry and straw colour, I am told that it should revive after rain, over the past couple of days we have had rain I’m pleased to say. Could you advise me if I should now scarify to remove the thatch / straw coloured grass please, or the best way to treat etc. Thanks for the question Steve. When grass dries out it hibernates. It does not grow until conditions improve and water is available. If it’s left alone it will re-grow from the tallest available growth nodes when water becomes available to the plant. New leaves will shoot from the ends of the stalks, if they have not become damaged. Very dry grass is very brittle. Soil can turn to powder and may not be very hard wearing. If the lawn is still used when very dry there is a chance the grass and soil will become so damaged and worn that it cannot recover. Only then will need repairing and re-seeding. Most areas of lawn which are left alone during a heatwave will not need this extra treatment. Unless the grass has been damaged beyond recovery you do not need to scarify. Apply seaweed biostimulant treatments during the drought period. This will help to feed bacteria in the soil and provide essential trace nutrients to the grass. This helps the grass recover quicker when the rains do come. Find out more about the benefits of seaweed in lawn care in this post. Feed the lawn as soon as growth starts. So as soon as the heatwave turns, apply a balanced non-scorch granular feed to the grass. This will enable the grass to find the essential food needed for growth. Once the soil is moist, aerating the lawn will help. Opening the soil is the first step into getting life back into the lawn. Be patient. Patience is the most valuable virtue in lawn care. See how the lawn recovers over the next few weeks and months. The lawn may take many weeks to start into growth again. Once the lawn is growing again start up your mowing regime. High and frequently. This will stimulate more growth and help to recycle dead grass. Unless you are looking to repair or have thick thatch, I wouldn’t scarify a drought affected lawn. You are much more likely to do damage than good. Chopping and tearing the growth nodes of the grass will knock it back and may kill it. Allow the lawn to recover itself. It has had a very difficult summer. If you are still seeing “stalky” grass come spring you may then look to scarify. A close mow to cut off the stalks and a spring-clean scarification combined with a feed will get the lawn off to a great start for the following summer. Fingers crossed it won’t be as dry! Thanks for your question Steve. I hope this is helpful! I have a lawn that is not the best quality but in the past has been hard wearing, this lawn is open to three dogs. I have now patches of the lawn where the earth has come through in patches and there is no sign of grass. I have watered the lawn a few times and have done letting it grow or cutting it back but I still have these patches of earth where the grass is not growing back into. Sir, what am I to do? I have tried patch repair kits to little or no success.